Welcome to our PB Services Guide. This guide will help you install PB Services which is required for Windows 2000, XP and Vista. This is required with PB Client versions 1.700 and higher. What is all this about new PunkBuster services? Beginning with PunkBuster client version 1.500, we have extended the PunkBuster Anti-Cheat system to operate without the requirement to run PunkBuster supported games with Administrator privileges when running under Windows 2000, XP, or Vista. In order to do this, we have developed new Windows service components to work with the PunkBuster system. PunkBuster will automatically begin using the new service components on supported systems. To manually install/uninstall the components, users may use our PBSVC Setup Program. 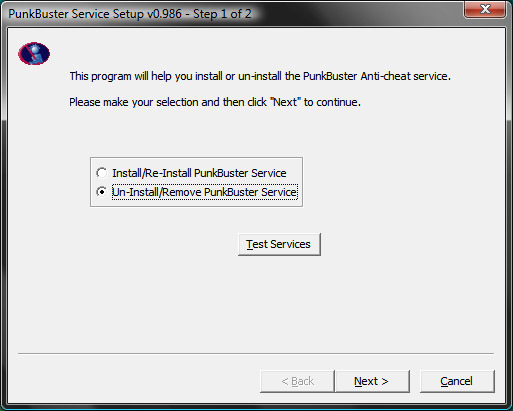 However, uninstalling the new service components will disable PunkBuster and may prevent playing on PunkBuster servers. Once the PnkBstrA service is running along with a new PB client version 1.500 and higher, running PB enabled games under Windows 2000, XP or Vista no longer requires Administrator privileges. I get kicked from PunkBuster servers for "handshaking failed" or "Losing Key Packets", how can I fix that? Some other software programs such as virus scanners, firewalls and Internet security software packages are suspicious of any new services and kernel drivers when they are first released. Some of these will block our new components thereby causing the "Losing Key Packets" kicking. Until these various packages are updated to correctly identify PnkBstrA.exe, PnkBstrB.exe, and PnkBstrK.sys as components of the PunkBuster Anti-Cheat System, players who experience PunkBuster kicks due to these conflicts need to either manually adjust the settings of the other software running on their system or disable the other software while playing on PunkBuster enabled servers. The new PunkBuster components make use of network resources and also frequently update files in the Windows system folders. This activity triggers warnings or blocks by some other security programs, some of which consider all unknown programs as threats or malware. Our new components are simply extensions of the existing PunkBuster system using new services and kernel software drivers, and are each signed with Verisign / Authenticode digital signatures for verifiable authenticity purposes. Most major security packages do not block our new components; users with other software that causes these conflicts should contact the vendor of their security package and request an update to correct this conflict. Starting with Windows Vista, there is a greater focus on security (which is a good thing). Unfortunately, however, with this focus comes a bit of complexity. In order for games having PunkBuster integrated to be more secure, the part of PunkBuster that needs full access to the computer for scanning purposes now must run all the time at the system level. This is necessary due to new Microsoft requirements for gaming under Windows. Are the new components optional? Starting with PB Client version 1.700, the new components are required. 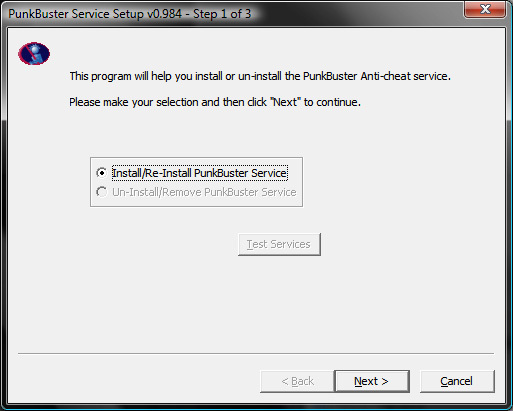 Uninstalling and/or disabling the new components will cause PunkBuster to stop working correctly and will cause frequent kicking from PunkBuster enabled servers. What exactly does the PnkBstrA service do? We have moved part of PunkBuster's auto-update functionality into the PnkBstrA service. This service is used by PunkBuster to update other PunkBuster components in the background while users are playing our supported games with PunkBuster enabled. By moving this functionality and others into services and drivers, the part of PunkBuster that runs inside the game no longer needs Administrator rights. What other components does PnkBstrA update? There are currently two other new components, another service called PnkBstrB and a kernel driver called PnkBstrK. These are not installed by the PBSVC Setup Program. They are installed and/or updated on the fly by PnkBstrA when a game is launched with PunkBuster enabled. PnkBstrB and PnkBstrK help PunkBuster look for cheats while users are playing on PunkBuster enabled servers. Do any of these components try to hide or spy on my system? How will I know if these new components are operating properly? The new service components are designed to log to the system LogFiles folder. On most systems, this is at C:\windows\system32\LogFiles\PunkBuster. The new components create and use a LogFiles subfolder called PunkBuster for logging messages. Under normal working conditions, the only messages you will see in the logs are initialization success messages. The new components automatically clear their respective logs after they reach about 100KB in size. More information can be found on the PB Services FAQ page on EvenBalance. If the Un-Install/Remove is greyed out that means PB service is not installed on your machine and you can press next. If it is not greyed out click the Test Services button and skip to PB Service Test Results in this guide. If the test finished with similar results as shown above the PB service should work correctly. If the Un-Install/Remove is greyed out that means PB service is not installed on your machine. If it is not greyed out select it and press next. Now the PB Service should be uninstalled. 2. Follow the guide above to uninstall the PB Service. 3. 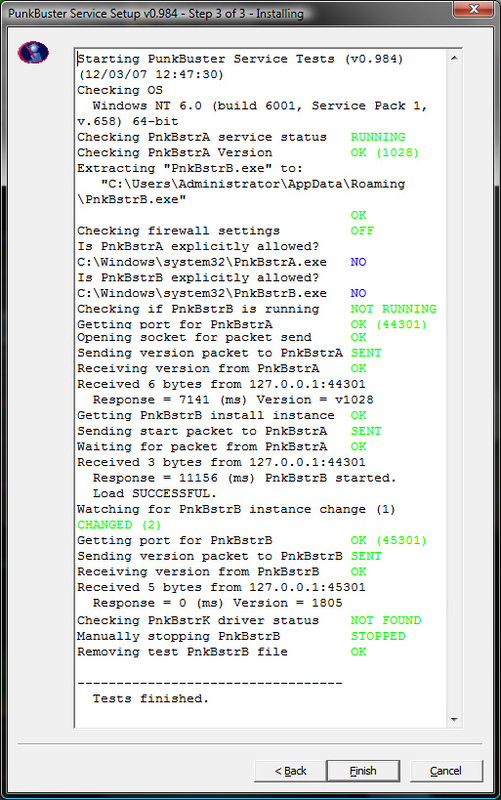 Run PBSetup (Guide found here ) to reinstall PunkBuster (this will also reinstall the services). 4. If that still doesn't help, submit a ticket to EvenBalance. There should be 3 log files pbsvc.log, PnkBstrA.log and PnkBstrB.log. [07.26.2007 16:12:58] PnkBstrA v1028 Service Started Successfully. This service is a component of the PunkBuster Anti-Cheat system. Visit http://www.evenbalance.com for more information. [07.26.2007 16:14:11] PnkBstrB v1.805 (PBSVC) Service Started Successfully. This service is a component of the PunkBuster Anti-Cheat system. Visit http://www.evenbalance.com for more information. [07.26.2007 16:48:25] PnkBstrB v1.805 (PBSVC) Service Started Successfully. This service is a component of the PunkBuster Anti-Cheat system. Visit http://www.evenbalance.com for more information. If you are getting kicked and you have a firewall, the firewall may be blocking PnkBstrA.exe and / or PnkBstrB.exe. Make sure your firewall is not blocking either of these. Also make sure that the loopback address (127.0.0.1) is not blocked.